G Ima Starr FA joined my little family December 8th of 2007. You know him as Speedy G. His story isn't remarkable in any way, but he was maybe the first horse that I bought with something specific in mind. I guess I should start at the beginning. Speedy's story actually started in the fall of 2006 when Mickey Dee first showed signs of an early lameness. After joint injections and six months of rest, I knew that Mickey Dee wouldn't be returning as an endurance horse, and I decided to sell him. 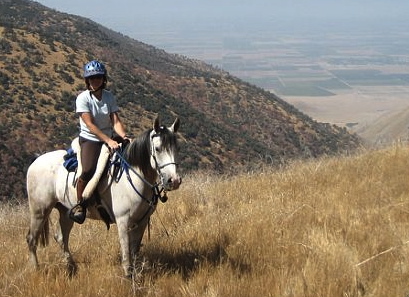 My plan was to buy a young Arabian gelding that I could start as my next endurance mount. Montoya was still going strong and I simply needed a back-up pony. I had a mare and knew that two mares was asking for trouble. Mickey was black and always had trouble with our summer heat. So out of that, I decided that I wanted a gray gelding and my search began. I wasn't in a hurry as Mickey was still in my barn, and I didn't want to feel pressured to buy the first thing I saw. I looked online for several months, but nothing was quite right. All the geldings I saw were either too old, had too many miles, or were simply too expensive. Eventually I spotted an ad on the classified page of Endurance.net, the endurance website, for a 4 year old, gray, Arabian gelding. His price was in the ball park so I sent an email and started making plans to go and see him. After some back and forth messages, Hubby and I made the three hour drive south to Perris, California. When we got there, I was pretty disappointed to discover that he was only three years old and while he was "broke" to ride, I could see that there was still a lot of work to be done. Saddling him required two people, the owner and the rider employed by Feather Arabians. Speedy fussed quite a bit while being saddled and he even reared as he was being bridled. I was already regretting the long drive we had made. Hubby, always unimpressed about equine antics, pointed out that all horses do that. Couldn't I just work with him? Well, yeah, I could, especially after all the training I had done with Mickey, but the point of paying this much was to not have to do all of the training. Since we had driven so far, we decided to see what the rider could do with him. The arena was a mile or so down the road (in an equestrian community with little or no traffic) so we followed the rider at a distance in the car and watched him school Speedy along the way. Much to our surprise, the rider had him plod though every puddle he could find. He sent him up onto the sidewalk and back to the road. He climbed dirt piles in an adjacent field, and jogged him along the shoulder of the road. As we parked and walked to the arena, both Hubby and I were looking at Speedy with a new level of respect. This horse had potential. The rider, a Hispanic gentleman who clearly had a good touch with horses, worked Speedy at all three gaits while we watched. He circled, backed, and leg yielded all around the arena. After some time, the owner asked if I wanted to ride. I'll admit it. I declined out of a healthy dose of respect for what a three-year old can do. I wasn't prepared to ride such a youngster. Hubby and I walked back to the car and started talking about the horse. When I decided to bring Mickey home, the conversation was more about my safety and what would happen if I got hurt. This conversation was about how suitable Speedy might be. Hubby liked him and was impressed with all the rider was able to ask him to do. I was more skeptical. I listed his problems: he was too young to start as an endurance horse (they have to be five before they can do 50-milers), and his ground manners were awful. Hubby pointed out his strong points: he was very athletic and already broke to ride. Knowing my ability to work with naughty horses, Hubby thought the ground manners issues could be worked out easily. I have a great amount of respect for my husband's opinions. He knows me very wellI and has a good sense of what I can do. If he liked the horse, there was probably more potential than I was seeing at that moment. Hubby was looking at the big picture while I was hung up on a birthdate and some rough edges. I decided to buy him. On the drive home, Hubby and I worked on names. We tried a lot of them. Since I am such a big NASCAR fan, I decided that he needed a racing name. After all, wasn't he going to be an endurance horse? His dam's name was G Im Fast and his damsire's name was Fast Ptrack. Suddenly it popped into my head that I frequently tell my students not to be a Speedy Gonzalez. You know, that little Mexican cartoon mouse that always zips around shouting, Andale, Andale! And Speedy G became his name. The next morning I met G Ima Starr FA's owner near Lancaster which is about the halfway point to Perris. Speedy loaded with no fuss and trailered all the way without a single sound. When I opened the door, he looked at me in surprise with a mouthful of hay. He unloaded quietly, walked into his stall, took a long drink of water, and dug into the hay that had been left in anticipation of his arrival. I wasn't ready to ride a three year old. Instead of continuing Speedy's under saddle education, which I felt was a bit spotty, I spent four months working on his ground manners. I worked diligently on his saddling and bridling issues. Knowing how stressful it can be to saddle and bridle a horse in freezing, 40 mph winds in the desert darkness, I decided that we were going to be ready for any kind of endurance conditions. I also used the long lines for ground driving and worked on mounting from a stand still. My plan was to do ground work until Speedy's fourth birthday in April, but the little stinker needed a JOB, and fast. So in March, a month earlier than I had planned, I started working him under saddle, first in the round pen, and then in the arena. 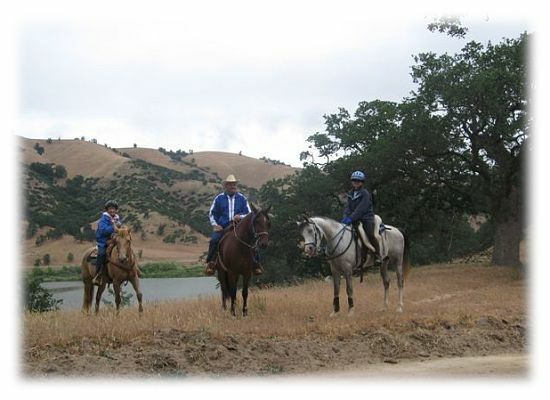 With the help of our barn's caretaker (center of the picture), Speedy started working on walking trail rides. Dario had a lovely mustang mare who proved to be a real Steady Edwina for a youngster. He graciously accompanied us on frequent trail rides. We trailered out to every local event we could find. 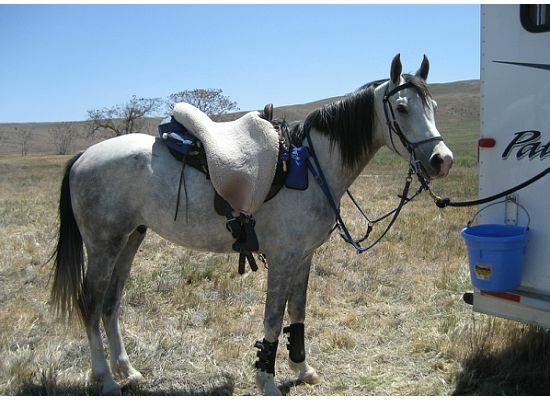 Speedy's four year old year was spent camping and trail riding in both small groups and large. 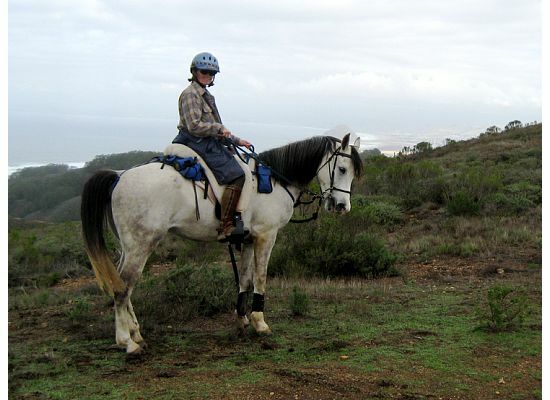 I knew that he would need those experiences if he was to be successful as an endurance horse. Speedy G's endurance career started out very well, and it may be that more races await him in the future. I don't know if my year of carefully planned camping and trail riding experiences helped, or if camping and trail rides were just in his genes. He took to the whole thing like a pro. He seemed to really like camping. He stood tied at the trailer with no issues and LOVED the Hi-Tie. Endurance riders put a lot of value on a horse who "takes care of himself." 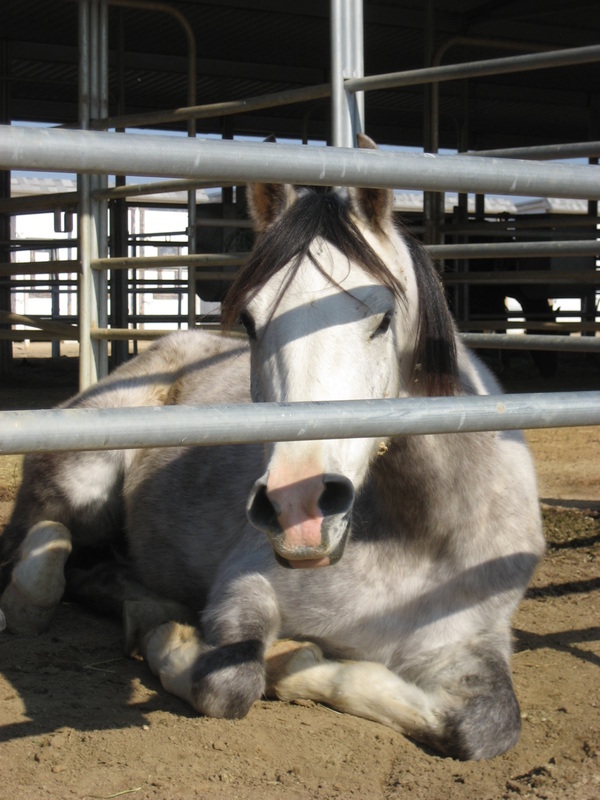 Horses that require a lot of coddling and care can be exhausting to ride. Speedy turned out to be a very independent and confident fellow at endurance rides. He ate and drank without any encouragement. I couldn't keep the hay bag full enough, and I frequently had to get up in the middle of the night to refill his water bucket. Horses could pass him on the trail or leave him behind, and he just didn't care. This trait alone makes an endurance horse's "price" go up. Who knew my little gray pony would have so much endurance potential? While he ate and took care of himself like an absolute super star, speedy he was not. There was no way to over ride him. He was very careful to conserve energy. He figured that out on his first 30 mile ride. 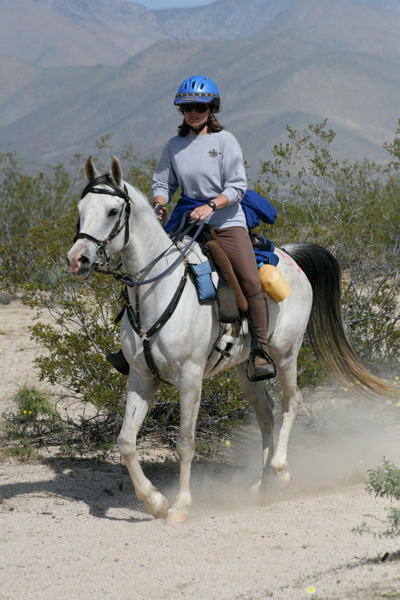 Many, many endurance horses start the race jacked up on adrenaline and end up burning far more of their gas tank's fuel than their bodies have been conditioned for. Not Speedy. He was the epitome of slow and steady. Not that I wanted to race him. Back of the pack was my goal, especially for his first few seasons. But when I did want to move out a bit faster, it took a lot of work to convince him that it was worth it! Speedy G did his first limited distance event (Crazy Coyote 30-miler) one month before his fifth birthday (four year olds may compete in distances under 35 miles). I really wanted to wait until he was five, but this particular race was well suited for a youngster. It is flat, wide open (no cliffs to fall over), and the vet checks are all in camp or very close by. The race went very well, but several miles from the finish, I thought we were going to need a vet while on the trail. Speedy G was dragging his toes through the sand, head hung low, and looked absolutely defeated. I kept checking his metabolic signs, but nothing other than his attitude indicated a problem. Taz's mom was riding with us. I encouraged her to ride ahead to the finish line, but she insisted on staying with us in an attempt to pull Speedy along. By this point, I was walking on foot, literally dragging him behind me. Speedy G's endurance career was off to a good start. He completed the Git-R-Done 30-miler a month later, and then spent the summer doing more camping and trail riding. I decided that I wanted Speedy G to be very versatile. I had seen with Mickey Dee that horses frequently need a second career, so I also started taking some dressage lessons with Speedy G. At first it was just monthly, weather permitting, but during the summer of Speedy's five year old year, we went once a week. The lessons probably weren't very "dressagey" as they were more about balance and control. As the fall arrived and I went back to work, we returned to once a month lessons when the weather permitted. I was still competing on Montoya and took her to several endurance rides that summer and fall. But in January, I lost her to colic and Speedy G went from back up horse to my only horse. While dealing with the sadness of losing Montoya, I took Speedy G to the Twenty Mule Team 35-miler one month later in February. We rode through some pretty horrific weather, and he once again showed what he was made of. In April we finished the Git-R-Done 55 miler with a ride time of 8 hours and 59 minutes. He still wasn't fast, but he was methodical. He caught the eye of several riders who asked if he was for sale - that always puts a smile on a rider's face. He was now six years old and ready for a full time endurance career. I was feeling confident in Speedy's ability, and I felt that he had potential to become a "stayer" in the sport. Montoya had competed for ten years, a rarity in the endurance world. I wanted the same for Speedy G. I entered the Just Coe Crazy 55-miler, but did it with a great deal of trepidation. It was advertised as a difficult race, and with only one other 55-miler under our belt, I didn't know if Speedy G was ready. My gut was right, he wasn't, but we were in good company. The winning time was more than two hours longer than a traditional 55-miler's winning time might be. We went 45 miles or so before Speedy called it quits. You can read about it here and here. After that ride, I just lost my interest in endurance. Most people who know me already know this. Without Montoya, the endurance world just didn't have the same luster that it once did. I decided to give Speedy the summer off, and we focused on dressage instead. 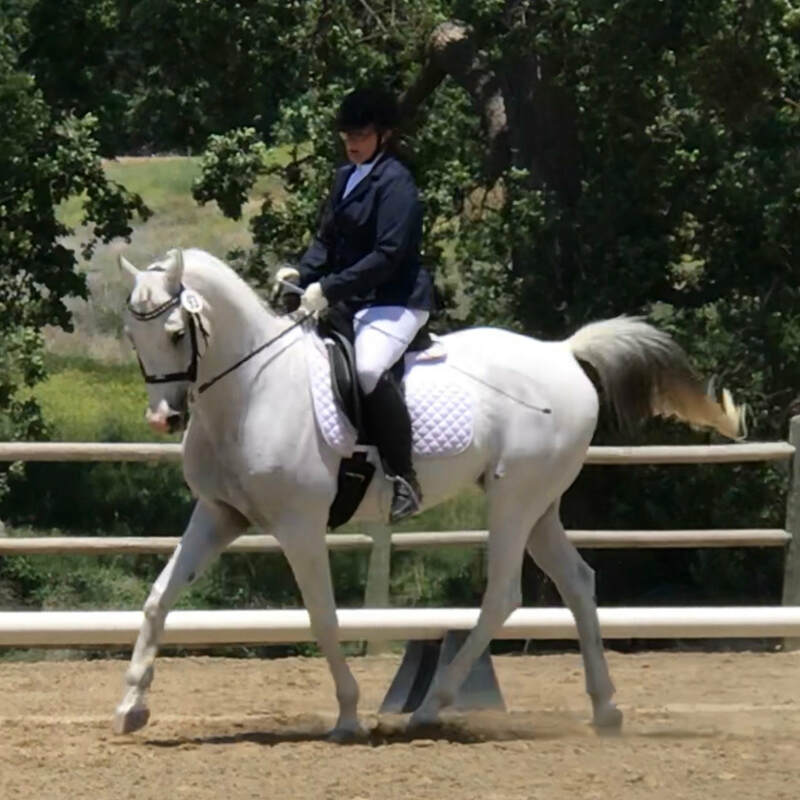 I started twice-weekly lessons with a different trainer and started showing. That was the summer of 2010. By fall, I realized that endurance races were probably a thing of the past. I don't know how Speedy felt about it, but we've not done an endurance race since. We now show pretty regularly and are working hard to advance as high as he and I can. Who knows? Maybe the day will come when the endurance world calls us back. Or maybe the call will come for just Speedy G.
That's Speedy's story ... for now!